“On behalf of the City of Reading, I would like to thank Baseballtown Charities, the Colonial Oaks Foundation, and the Wyomissing Foundation, as well as, the other donors,” said Mayor of Reading Vaughn Spencer. “The renovations at Baer Park will improve the lives of our city youth by providing them with a much improved facility. Today, Baer Park is a nerve center of activity in the 15th Ward. On any given day, hundreds of youth can be found using the various attractions or having fun by spending time with friends. Throughout the spring and summer, the park’s baseball field is home to numerous city baseball and softball organizations. It is also the home field for junior high teams from the Reading School District. On top of donations from the Colonial Oaks Foundation and Wyomissing Foundation, funds were raised at Reading Fightin Phils home games in the summer of 2013. The centerpiece of the team’s fundraising efforts came late in the season when first baseman Jim Murphy donated his prized 1991 Jaguar XJ6 Sovereign for a raffle. Fans came out in droves to support the cause thanks to Murphy’s Jaguar and raised over $5,000 for Baseballtown Charities. As an unconventional means of raising awareness and funds for a non-profit, the raffle helped cement Reading as the Eastern League’s nominee for the inaugural John Henry Moss Community Service Award presented by Minor League Baseball. Baseballtown Charities, a non-profit 501(c)(3) entity, was founded in 2002 in association with the Reading Phillies in order to keep baseball alive in Reading through charitable donations to underprivileged youth who otherwise wouldn’t have the opportunity to play baseball. The organization also pays tribute to Reading’s rich baseball history. Perhaps the biggest accomplishment the organization has overtaken was the construction of Gordon Hoodak Stadium at Lauer’s Park in 2006. 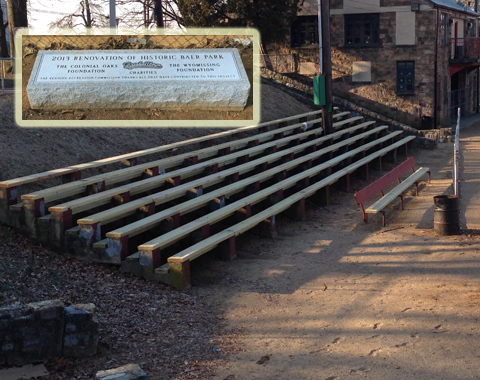 Through contributions exceeding $900,000, the youth ballpark was built in a neighborhood that is quickly returning to its glory days. It sits on the grounds of Lauer’s Park Elementary School, named for the former stadium where Babe Ruth and Shoeless Joe Jackson both played. The original housed several professional teams and hosted barnstorming tours from 1907-1941. Reading’s own baseball legend, the late “Broadway” Charlie Wagner, former Red Sox pitcher and roommate of Ted Williams, began his career there. The Legends’ Community Organization of the Night program offers non-profits an opportunity to increase awareness of their work. The Community Organization program offers non-profits a variety of opportunities to publicize their work at Whitaker Bank Ballpark and on Legends radio broadcasts during each of the Legends’ 70 home games. Hundreds of organizations throughout central and eastern Kentucky have participated. Just Drive, an initiative by the Greenville Drive and several community partners to curb teen texting and driving, launched Jan. 22. Greenville, SC – The Greenville Drive has renewed its commitment to making Greenville County’s roads safer by educating teens about the dangers of texting and driving. The Drive – along with community partners Michelin, N.A., Verizon Wireless and Bradshaw Automotive – have launched the Just Drive campaign for the second straight year to encourage students at all Greenville County high schools to sign the pledge to not text and drive. The 2014 Just Drive campaign was announced at a press conference on Wednesday at Eastside High School, where the Drive unveiled several upcoming activities to engage students. 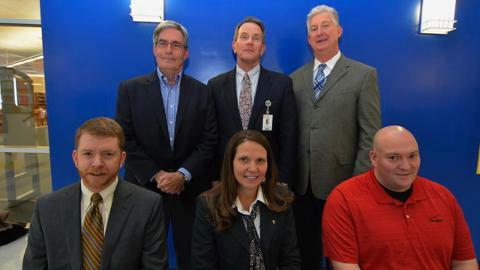 The press conference featured representatives from the Greenville Drive, Michelin, N.A., Verizon Wireless, Bradshaw Automotive and the principal and student from Eastside. Special guests included representatives from Greenville County Schools, the City of Greenville, the City of Greenville Youth Commission and students from Eastside High School. The press conference highlighted the Drive’s primary objectives for the Just Drive campaign, including the announcement that students will participate in a creative challenge to design a t-shirt logo for the campaign. In addition, the Drive announced plans for an invitational baseball game at Fluor Field and a Celebration Game during the Drive’s upcoming 2014 season, both of which will be open to students who have made the pledge. “We encourage students, and drivers of all ages, to please pull off the roadway in a safe location if you must send or respond to a text or place a voice call when you are behind the wheel,” said Wes Bradshaw, General Manager of Bradshaw Chevrolet, Buick, GMC and Cadillac of Greer. Greenville Drive employees are teaming with volunteers from Verizon Wireless to speak to students during school lunch hours about the dangers of distracted driving, and to encourage them to avoid texting, talking on the phone, eating and other distracted behaviors that pulls attention away from safe driving. Students will be asked to sign a pledge as a promise to the community to not text while driving. To sign the pledge to Just Drive, please visit facebook.com/justdrivepledge. The Greenville Drive, the South Atlantic League affiliate of the 2013 World Series Champion Boston Red Sox, just completed its 8th season at award-winning Fluor Field, located in Downtown Greenville. Since 2006, more than 400,000 fans a year have been welcomed to Fluor Field for both Drive games and additional community events. 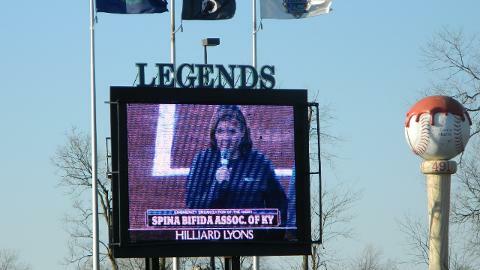 The Drive has received numerous awards, including Ballpark of the year in its Inaugural 2006 Season, the National Sports Forums Overall Award for Excellence for Sports Marketing in 2010 and 2011 and the prestigious Freitas Award in 2012, presented by Baseball Americaand given to an organization which exemplifies excellence in operations, franchise stability and community engagement. 31 Drive alumni have gone onto play at the Major League level, including Clay Buchholz, Xander Bogaerts, Brandon Workman, and Will Middlebrooks. Dedicated to the improvement of sustainable mobility, Michelin designs, manufactures and sells tires for every type of vehicle, including airplanes, automobiles, bicycles, earthmovers, farm equipment, heavy-duty trucks, motorcycles and the space shuttle. The company also publishes travel guides, hotel and restaurant guides, maps and road atlases. Headquartered in Greenville, S.C., Michelin North America (www.michelin-us.com) employs more than 22,300 and operates 19 major manufacturing plants in 17 locations. Verizon Wireless operates the nation’s largest and most reliable 4G LTE and 3G networks. The company serves 101.2 million retail customers, including 95.2 million retail postpaid customers. Headquartered in Basking Ridge, N.J., with nearly 72,000 employees nationwide, Verizon Wireless is a joint venture of Verizon Communications (NYSE, NASDAQ: VZ) and Vodafone (LSE, NASDAQ: VOD). For more information, visit www.verizonwireless.com. For the latest news and updates about Verizon Wireless, visit our News Center at http://news.verizonwireless.com or follow us on Twitter at http://twitter.com/VZWNews. Bradshaw Automotive began in 1979, when William Bradshaw and his wife, Annette, purchased a small Oldsmobile/Cadillac Dealership in Greer, South Carolina. While the organization has grown considerably, it is still a family-run operation. William is active in the day-to-day operations of all of the dealerships and is now aided by his son, Wes Bradshaw, and his son-in-law, Bill Donovan. The growth and success of Bradshaw Automotive can best be explained by William’s philosophy of treating employees and customers like family, and always respecting their needs. 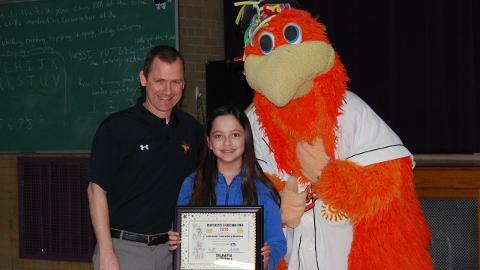 Salisbury, MD – The Delmarva Shorebirds and Sherman the Shorebird visited Federalsburg Elementary school on Wednesday, January 15 to honor Linda Davila as the 2014 Hit the Books Bookmark Design Contest winner. After careful review by Shorebirds staff members, Linda’s design was selected out of over 1,000 submissions. Click here to see her winning entry. Linda is a student at Federalsburg Elementary School. Her bookmark design was printed and distributed to the over 40,000 students involved in the Shorebirds Hit the Books program presented by Dr. James M. Crouse at The Brace Place.